Meanwhile, be sure to watch the video embedded below this article for details on the changes Hadsall has made on his program’s presentation. Is Over 40 Ab Solution by fitness trainer Shaun Hadsall a scam or not? In my opinion, I think it is a scam and in this review you’ll find out why I reached this conclusion. In this comprehensive review I’m not just going to deal with this product, but I’m also going to relate it to his older programs The 4 Cycle Solution and 14 Day Rapid Fat Loss Plan. So take your time and study it as it is going to be interesting! So who is this program for: People over 40 or people over 35? That’s by the way. Let’s find out who this Shaun Hadsall is, shall we? 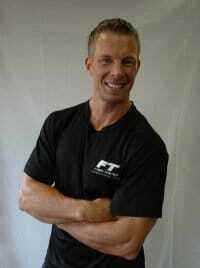 At Over 40 Ab Solution, Shaun Hadsall never tells us who he actually is. But at his other product 14 Day Rapid Fat Loss Plan, he calls himself ‘a fat-loss coach and nutrition expert.’ He never tells us how he qualified to be a fitness coach, except for the claim that he was the first runner-up of the Body-for-LIFE contest in 1998. Well I checked at Body-for-LIFE website, and Hadsall is NOT mentioned anywhere in their records. The same scenario played out when I tried to verify his claim that he has been featured in/on Amazon, New York Times Bestsellers, Oxygen, ESPN, etc. Search for him on those websites, and you’ll come up with nothing. Hadsall goes on to claim that he and his wife Karen opened and ran a ‘world’s Top 10 personal training studio franchise’ in Michigan ‘for over five years straight.’ He however, does not tell us the name of this training studio so that we can check it out ourselves. Finally, Hadsall runs a blog called Get Lean in 12, where he writes on fitness and weight loss tips. One of my favorite articles on his blog is this piece on how skipping breakfast burns belly fat like crazy. However, he fails to tell you that those who skip their breakfast are most likely to regain lost weight than those who eat breakfast [CBass.com]. Bottom line: Skipping breakfast definitely leads to weight loss, BUT you will eventually gain them all back in the long run. Eating breakfast prevents that from happening. Hadsall: I placed 1st runner up in the Body for Life Challenge (the name was changed from the EAS physique transformation challenge to Body for Life) when I entered the contest. The reason I’m not mentioned anywhere on the newer website is because the old site was taken down when the company was sold–so they only post contestants that placed 1st… I was 1st Runner Up behind Scott Nelson. 2. On His Getting Featured on Oxygen, New York Times Bestsellers, etc. Hadsall: I own a global license for Macro-Patterning which was featured in 2 NY times best selling books (Crack the Fat Loss Code and Conquer the Fat Loss Code by Wendy Chant who passed away a few years back when she gave the license). I was featured on ESPN as a spokesperson for EAS supplements when I placed 1st runner up in the BFL. Hadsall: I owned and operated a Fitness Together franchise for over 5 years and we were #8 in the world out of over 350 franchises… I don’t mention the name because the franchise won’t allow me to after selling my studios. However, I have an issue with these photos. Why? Because these same photos were used on 14-Day Rapid Fat Loss Plan and The 4-Cycle Solution! Which product did Karen use to achieve her weight loss: Over 40 Ab Solution, The 4 Cycle Solution or 14 Day Rapid Fat Loss Plan? Did she lose 22 pounds (Over 40 Ab Solution, The 4 Cycle Solution) or 23 pounds (14 Day Rapid Fat Loss Plan)? Did Karen lose 22/23 pounds in 8 weeks (The 4 Cycle Solution) or in 10 weeks (Over 40 Ab Solution, The 4 Cycle Solution)? Are all these programs the same? If yes, why is Shaun Hadsall selling them separately? Again, here is Shaun Hadsall to answer these questions. Hadsall: The story about my wife is 100% true. 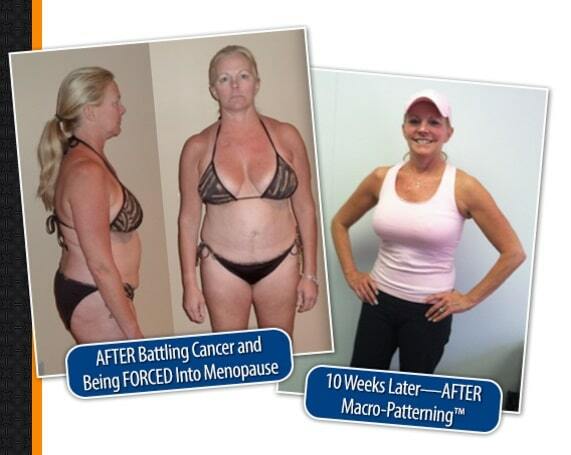 We discovered the protocols used for the product after her cancer journey AND the strategies used in my other products are the same strategies used in The Over 40 Ab Solution. If you wanna bash my 22 vs. 23 pounds… or 8 vs 10 weeks inconsistencies… I could care less! Hope Hadsall has cleared the air? OK. Now to the product itself. Primer #1 supposedly ‘FLATLINES your body’s #1 fat storage hormone so you can easily, and automatically, access your most stubborn fat cells.’ Hadsall never mentions this hormone, but I think he’s referring to insulin, the body’s major fat storing hormone. Primer #2 supposedly releases the hormones that specifically allows your body to access ‘stubborn’ fat cells. However, Hadsall never mentions these hormones. In fact, the article he referenced to authenticate this primer (scroll down to the bottom of the page and click on number 12) talks about an entirely unrelated subject: Urinary stones. Primer #3 is a ‘metabolic trick’ that ‘naturally’ releases more growth hormone during and after workout. To prove this, Hadsall links to a research article stating that increased blood lactate level as a result of exercise plays a major role in the release of growth hormone in people over 35. Hadsall believes that growth hormone can help you in burning belly fat. But he failed to mention that growth hormone does NOT cause weight loss in obese people [WebMD]. Movement #1 is the alleged ‘missing link’ that ‘turns on your fountain of youth.’ According to Hadsall, this movement is a ‘simple 20-second belly burning trick that releases the ONE and ONLY fat loss hormone responsible for breaking apart “trapped” fat cells so they can be burned off and permanently REMOVED from your body.’ Hadsall never mentions this hormone (which I think is either leptin or glucagon), but he linked to a Clarence Bass article stating that people who do 20-second High Intensity Interval Training (HIIT) lose more subcutaneous fat than those who work out for long periods. However, Hadsall failed to mention that in the same article, Bass clearly warned that this kind of workout is NOT suitable for beginners, obese people not used to exercise and those at risk for health problems. Movement #2 is ‘a simple 30-second movement that increases your “youth hormones” up to 450% making you look years younger in just a few short weeks.’ Hadsall never tells us about these ‘youth hormones’, but linked to a research article talking about how 10-minute high intensity exercise boosts your body’s growth hormone level. Movement #3, using Hadsall’s words, is ’60-second fat burning shortcut that is THE fastest way to drain your body of unwanted energy reserves so you can get leaner—FASTER.’ Hadsall claims you will NEVER hit a weight loss plateau if you perform this unknown movement. Zone 3: This zone works by allegedly ‘flushing out’ the fat in your belly, making it look flatter in ‘only 12 minutes a day.’ Hadsall claims that you will definitely regain all your previously lost ‘stubborn fat cells’ if you don’t enter this zone. Secret #3 is a 2-minute exercise that supposedly ‘finishes off’ the removal of your body’s stubborn fat cells. Hadsall doesn’t explain how this exercise works. 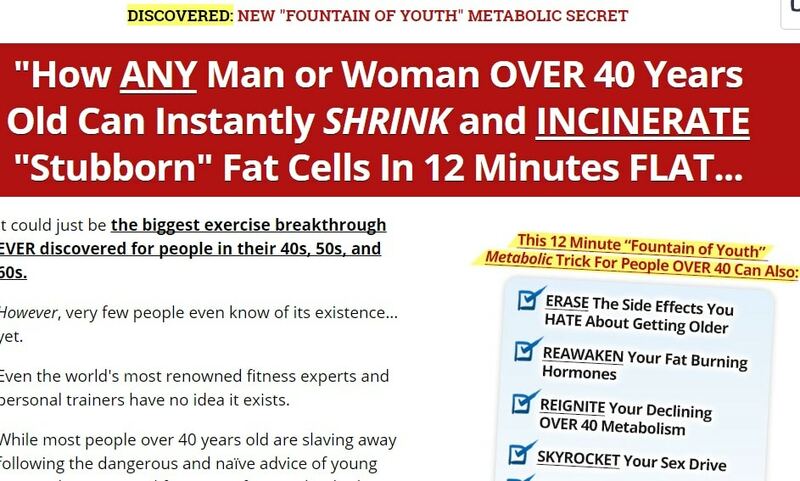 Over 40 Ab Solution is rife with scammy advertising. For example, Hadsall spends several minutes in his presentation video telling you that the money-hungry Big Pharma and the weight loss industry have conspired to tell you lies so that they’ll keep selling you products that do not treat the cause of your problem. According to him, the weight loss industry intentionally hid 4 research findings from the public, yet ironically, the supposedly hidden research findings are available online for everyone to use. In fact, Hadsall even cited them below his presentation video, but for some reason, he left out posting the links to them. So who is hiding the research now? Hadsall also insinuates that your weight issues has nothing to do with genetics (a big, fat lie). And then there is the pop-up preventing you from leaving the video page. All the testimonials on Over 40 Ab Solution are actually photos recycled from Hadsall’s older products 14 Day Rapid Fat Loss Plan and The 4 Cycle Solution. Of course, this is not the first time I’ve encountered this. Bruce Krahn of Lean Belly Breakthrough and ‘Craig Ballantyne’ of 6 Minutes To Skinny did the same thing. Again, Hadsall has an explanation. Hadsall: Any of the recycled testimonials are just clients that used 14 Day and 4 Cycle too, along with Over 40 Ab Solution, which is all the same info repackaged inside the newer product. On the video page, Over 40 Ab Solution is priced at $20. But if you happen to be on the text version of the website and scroll down to the pricing area, you’ll see a 15-minute countdown timer offering you a 75% off on a $89 product. If you do not make up your mind in 15 minutes and later click on the ‘Add to Cart’ button, you’ll indeed pay $89. But return to the page by clicking the ‘back’ button on your browser … and the countdown timer resets itself, starting from the beginning. If you fall for his antics and buy his product, you will be billed $7 monthly for access to ‘Get Lean in 12 Club.’ Hadsall never mentions this ‘club’ in his Over 40 Ab Solutions pitch page. This is the most wicked pricing I’ve ever seen so far. Don’t fall for it! Final Conclusion: Over 40 Ab Solution Looks Like A SCAM! 1. Trim Down Club. This is an 8-week weight loss community program designed by a team of experienced dietitians and scientists. For just $1.99, you’ll get one-month access to an amazing Menu Planner, 8-week weight loss eating plan, free access to free expert consultation and much more. You can either join now or read my review for more details. 2. Eat Stop Eat. This is an amazing weight loss program that has stood the test of time. Written by nutrition expert Brad Pilon, Eat Stop Eat promises to show you the correct way of doing intermittent fasting – a proven method of losing weight. You can either get the program now or read my review for more details. So far, I have not seen any positive feedback for this product anywhere on the web, apart from the testimonials posted on the pitch page. The feedback I’ve gotten so far from this product is scanty and so far, negative. But I need more feedback from those who have used this product. So if you’ve used it, I’ll appreciate it if you can share your opinion with me on the comments section. Thank you! How often are we told that if it’s too good to be true, then it probably isn’t? A case in point? Oops! I meant ‘If it’s too good to be true, then it probably is’. This guy is a phony…he writes fake reviews on the products to get us to buy them because he’s paid a commission. He also sells our information to 3rd parties. Just as it states in his “terms and conditions” don’t sign up for this crap. This guy obinna lives in Nigeria for heaven’s sake.. lol Typical scammer operating in some 3rd world country avoiding and hiding from the law. Contra health is a hoax!! I’m glad I wasn’t taken in by it. I don’t see why his place of residence should be of any consequence. We live in a globalized world. And your derisive comment about it being a Third World Country? Racist much? You deserve the EPIC burn he gave you in his response. This is a VERY hypocritical “review” coming from a guy who has banner ads on his site promoting the exact types of products he bashes on this site….. I don’t have control over the ads shown on this website. It is Google that places those ads based on what they think are your interests. However, I’ve noticed that a suspicious product keeps showing in the ads each time this review is loaded (the V-Taper Solution). I’m looking into it now. I’m sorry you did not heard back from us. Our customer support team is always available to answer any questions you may have so it’s very unlikely for us not to respond immediately. We stand completely behind our product, so if you’ll contact us, we will address your issue immediately. I bought this and can’t open any of the links. I have sent several emails and no one has responded to me. Shawn does say the team is the best at getting back to us but nothing so far. I want my money back. How do I go about getting it. to me it looks like his wife has a girdle on in the workout cloths,,if you look closely,, and why wasnt she wearing the same bikini and same angle shots as before, which makes me skeptical.. I agree with this 110%. !! Currently waiting for my refund. Their excellent customer service, is proving to be as rubbish as the product they sell. I agree with this 110%. Currently waiting for my refund. Their”excellent “ customer service is proving to be as rubbish as their product ! I asked for my refund and got it right away. I agree it is a bit scammy as the price here in Australia is $197 after you paid $37 for the promotional video. I would rate it as a 2 out of 10. Is it a scam? Since every magic formula/pill/potion/quick and easy exercise sold on the web with slick advertising and dubious claims is a scam, yeah it is. There is some actual evidence that HIIT and interval fasting work, but there is nothing quick and easy about it. My main point though is am I the only person that knows 75% off $89 would be $22.25, not $29? That fake math alone makes it a scam. I am with Lisa, I do not believe you either. I know how ClickBank works and, to get the order of protein, you have to click “YES” in order to order it. It is definitely possible that you clicked the wrong button, but that is not them shipping you something that you did not order. Thank you for this review before I wasted my hard earned money. I realized after ordering this product and watching some videos that I would not be able to start the exercises due to my physical limitations. I have requested a refund. I will let you know how this process goes. Unfortunately, i believe that I may have learned a pricey lesson. However, I did receive an almost immediate response telling me that my email had been received and that I will receive a timely response. It is currently 1:30 am so the team may very well be out of the office for the night.